OVERLAND PARK, KS. 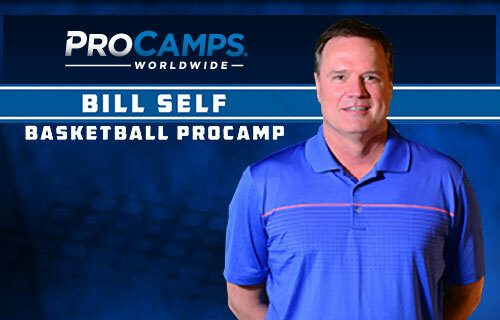 — Join 2008 National Champion, 11-time Big XII Champion, and 2012 Coach of the Year, Bill Self, at the Bill Self Basketball ProCamp presented by Academy Sports + Outdoors and SunnyD on August 8-9 at Shawnee Mission West High School. Time: 9:00 AM to 12:00 PM for boys and girls grades 1 – 12. Cost: $149. Throughout the camp Bill Self will offer tips and instruction, highlighting the finer points of basketball. Participants will experience various stations specializing in fundamental basketball skills and will participate in basketball games. Participants will be placed in small groups according to age to ensure that each child gets maximum instruction. Bill Self is the men’s head basketball coach at the University of Kansas, where he has led Kansas to eleven straight Big 12 Conference regular season championships from 2004-05 through the 2014-15 seasons. He is an 11-time Big XII Champion, 2008 National Champion, and 2012 Coach of the Year. He has been the men’s basketball coach at Kansas since 2003. He led the Jayhawks to the 2008 National Title and was named AP Coach of the Year in 2009. Self is also a popular motivational speaker and keynote speaker and is available for speaking engagements, charity fundraisers, marketing campaigns, personal appearances & corporate events. If you would like to book Bill Self for a speaking engagement or appearance, contact Bill Self’s booking agent for appearance fees at Sports Speakers 360.